In the December 2016 update, Clash of Clans added events into the game; little challenge that can earn you XP and gems. For every event, you will have a special discounted troop or spell, which possibly the option to gain XP and gems. There is always an event going on so this will be a list of every event in Clash of Clans, updated as new events come out (newest event will be at the top). There is a two pronged event going on right now in Clash of Clans, with Whirl Power, featuring valkyries, and Tiny & Shiny, featuring goblins. You can win 300 XP and 30 gems for completing each event, but with the Whirl Power event you also get a training potion and with the Tiny & Shiny event, you get a resource potion. You’ll need to win 10 battles with 20% of your army camp being valkyries to finish the Whirl Power event and you’ll have to win 10 battles with 15% of your army camp being goblins in order to complete the Tiny and Shiny event… good luck! The GoWiPe event is back once again in Clash of Clans, combining golems, wizards, and PEKKAs in a killer combination to make it easy to win this CoC event. The rewards are the same for each troop: 400 XP and 100 gems for winning 7 battles. You need to use 2 golems, 12 wizards, and 2 PEKKAs in each attack in order to have it count towards the GoWiPe event. Obviously, the best strategy to use in order to win this Clash of Clans event is GoWiPe. You can push some trophies as well as complete the event using this strategy! Clash of Clans has two simultaneous events going on again, the Sorcerous Storm event, which combines wizards and rage spells, and the Basalt Assault event, which features lava hounds and poison spells. There are two different rewards for completing each event: for Sorcerous Storm, you need to use 12 wizards to win 3 battles to be rewarded with 300 XP and a builder potion while for Basalt Assault, you need to use 2 lava hounds to win 3 battles to be rewarded with 300 XP and 2 resource potions. There are tons of army compositions that use wizards like GoWiPe or GoWiVa, so that event should be pretty easy to win. As for the Basalt Assault event, definitely go with a LavaLoonion army comp. Good look with the dual events! We again have two events in Clash of Clans, one being a bowler event called How We Roll and the other being a dragon rage spell event called Angry Wyrms. For the How We Roll event, you’ll need to use 8 bowlers to win 3 battles. You’ll be rewarded with 300 XP and 2 resource potions! As for the Angry Wyrms event, you are required to win 3 battles using 2 dragons to receive 300 XP and a builder potion. These two events shouldn’t be too hard to complete, as long as you use good strategy to win. The How We Roll event is best won by using a bowler/queen walk army composition while you can use mass dragons to win the Angry Wyrms event! This week’s double event in Clash of Clans combines PEKKAs and healers in two different events, Merciful Mayhem and Metal Militia. For Merciful Mayhem, you need to use 3 healers to win 3 battles in order to win the rewards of 300 XP and 2 resource potions. As for the Metal Militia event, you’ll need to use 2 PEKKAs to win 3 battles for the rewards of 300 XP and 2 resource potions. It is kind of tough to combine healers and PEKKAs into the same army composition, but you can use GoWiPe as a pretty strong PEKKA army. As for use from the healers, go ahead and try doing a queen walk if you are Town Hall 9 or higher! Once again, Clash of Clans is going to have two events going on, the GIBARCH event and the Finer Miner event. GIBARCH is going to combine giants, barbarians, and archers, with you needing to use 10 giants, 48 barbarians, or 48 archers to win 10 battles. If you win 10 battles, you will earn 150 XP and 30 gems for each troop! In the Finer Miner event, you need to only win 3 battles using 8 miners in order to win 300 XP and 2 resource potions! In order to win these two events, I’d recommend using the GiBarch strategy for farming, or just using barch to win two of the events. For the miner event, you should definitely use a miner heavy deck, probably going with mass miners! There are two new Clash of Clans events going on right now, the Rock Hard event and the Whirl Power event! The Rock Hard event, as you probably thought, is going to be based around golems, rewarding you with 2 power potions and 300 XP for winning 3 battles using 2 golems. The Whirl Power event is based around valkyries, giving you 300 XP and a builder potion for winning 3 battles using at least 6 valkyries in your army. As usual, both troops are 60% off! In order to really take advantage of this event, I would definitely recommend using the GoWiVa strategy, which will combine valkyries and golems to make it so you only have to attack 3 times to win both events. Good luck in this dual event for Clash of Clans! The newest Clash of Clans event is the Shred Zepplin event, which combines balloons and haste spells in a killer combination! This is a bit of a smaller event, with the rewards of 300 XP and a builder potion coming when you win 3 battles with 10 balloons in your army. As with every event, both haste spells and balloons are 90% off! In order to take advantage of this event, you should use either precision balloonion or LavaLoonion. Using those two strategies, it should be pretty easy to get wins while using the 10 balloons required to earn the rewards! The sorcerous storm event is here in Clash of Clans, combining wizards and rage spells together to create storms of sorcery. During this event, both wizards and rage spells are going to be 90% off in elixir. For this Clash of Clans event, if you win 3 battles using at least 12 wizards, you will be rewarded with 300 XP and a builder potion! In order to win this event, I would suggest using either a giant-wizard farming strategy, or go ahead and rock a classic GoWiPe strategy. Depending on whether you are pushing or farming, you can definitely find a solid wizard army composition to win the sorcerous storm event! The newest Clash of Clans event is the happy hogs event, which combines the hog rider and heal spell in an epic event. In the happy hogs event, you can train and brew hogs and heal spells at a 90% discount. As an added bonus, if you win three battles using at least 10 hog riders, you can earn 300 XP, as well as 3 training potions! In order to win the training potions, you should definitely try to win three battles. For Town Hall 9, I would recommend using GoWiVa, which for Town Hall 8, I would try to go for mass hogs. With those strategies, you should definitely be able to win battles, while taking advantage of the discounted prices! Colossal contamination is going to be returning in Clash of Clans, having giants and poison spells to help win you a book of building for competition. You’ll need to win 20 battles with at least 10 giants in order to win the final rewards of 600 XP and that book of building. As well as the rewards, all giants and poison spells are 90% off! I would recommend using a giant farming strategy in order to complete this event, as it is the most efficient way to finish with ease. Since you need to win 20 battles, you should go with a cheap army composition, making it so that you don’t have to spend too much elixir. The triple threat event is back in Clash of Clans, combining golems, wizards, and PEKKAs in a killer combination for GoWiPe. With this CoC event, you can win rewards by using each of the three troops and receive the same rewards for each. If you win 10 battles with either golems, wizards, or PEKKAs, you will win 30 gems and 150 XP for each event completed. Obviously, the best way to win this event is to use a GoWiPe army composition, allowing you to complete all three events at one time and earn 450 XP and 90 gems overall. Keep in mind, you need to be at least Town Hall 8 to use both golems and PEKKAs, but you can get the rewards using wizards! The dragon and lightning event is back in Clash of Clans, now known as the Thunderstruck event! By winning this event, you can walk away with a Book of Heroes. However, in able to do that, you have to win 20 battles using a certain amount of dragons. You also get 600 XP for finishing the event. I would recommend using mass dragons if you are at Town Hall 7 through Town Hall 9, and then at TH10 and TH11, use a LavaLoon army composition with some dragons mixed in. With dragons being 90% off, you should definitely be training as many as possible! The newest Clash of Clans event is going to be the colossal contamination event, combining giants and poison spells in CoC. This event rewards you with a Book of Building for completion, so its definitely worth doing the colossal contamination event. You need to win 20 battles with at least 10 giants in your army in order to to earn 600 XP and the Book of Building. Since both giants and poison spells are 90% off, I would recommend training both, but you only really need the giants to win the event. Giants are great because you can use them for farming or pushing. Good luck with this giant and poison spell event! To celebrate the 4th anniversary of clan wars, Clash of Clans is giving us the Art of War event! This event in CoC is giving us 4x clan war loot and 4x clan XP during the anniversary event! While this event is going on you should definitely being doing a clan war for the increased rewards! There are no specific rewards for this event, but you can boost your clan up by doing wars during the Art of War event. The Schoolhouse Rock event is here in Clash of Clans, combining golems and jump spells in a killer event. The reward for completing this event is 600 XP and a book of heroes, so its definitely worth competing in! You must win 15 battles with 2 golems each though, which is a lot of battles. Here’s some strategies to help you out with beating the Schoolhouse Rock event in CoC! GoWiVa is a great strategy to try out for Town Hall 9, Town Hall 10, and Town Hall 11. GoWiPe, a classic Clash of Clans strategy, is also pretty viable for this event for all Town Halls 8-11. Whatever strategy you end up using, just make sure that it includes at least 2 golems! With the best Clash of Clans event name, the Hateable Inflatable event is here, combining balloons and haste spells in a deadly combination. This event lasts for quite a while, but gives you great rewards for completion! If you win 20 battles with 8 balloons, you will be rewarded with 600 XP and a Book of Spells. Also, balloons and haste spells will be 90% off during the Balloon and Haste Spell Event! There are a whole bunch of attack strategies that combine haste spells and balloons, but I would recommend either going with LavaLoonion or precision Balloonion. If you want more stars, go ahead and attack with LavaLoonion, but if you want to specialize in an attack, try out Balloonion! In the Sparks Will Fly event in Clash of Clans, you will be able to win the new Builder Potion, provided you win 20 battles using at least 12 wizards in your army composition. The wizards, as well as rage spells, will be discounted at the usual 90% in the duration of this event. From winning this event, you’ll get two of the Builder Potions, as well as 600 XP! A lot of different strategies use this wizard and rage spell combination; everything from GoWiVa to giant-wizard. Make up your own strategy combining these two, but remember, you only need wizards in order to win this event! Throw in the rage spells for a cheap army cost and a huge damage boost! The newest event in Clash of Clans is the angry angels event, which combines rage spells and healers together in an awesome combo! During the event, you need to use 3 healers and win 10 battles in order to pick up the rewards of 300 XP and 100 gems. As always, rage spells and healers will be 90% discounted during this event. The best strategy to use with healers, as long as you are Town Hall 9+, is definitely queen walk. You can pick up some great three stars and practice for war. If you don’t want to go this hard, go with a simple giant healer to cash in on the rewards. Clash of Clans has a double event for this week, with the 4x star bonus and the clan reWARds events both coming into the game. 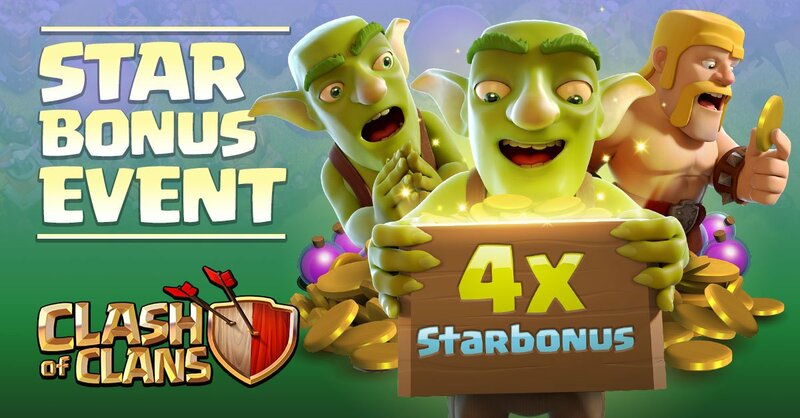 The 4x star bonus will give you 4x loot from your star bonus while the clan reWARds event will give you 2x the loot and 2x the XP during this clan war event! Definitely take advantage of these two events, especially with the Lunar Games coming up tomorrow. If you are attacking and warring a lot over the next five days, you should be able to get a bunch of loot! The hog homecoming event is here in Clash of Clans, relying on all hog riders to win this event. The prizes for winning an event have never been higher, with victory rewarding you with 600 XP and a Book of Fighting. However, it takes a while to win the hog homecoming event, as you need to win 25 battles using 10 hog riders. While you need to win 25 battles, you also have 6 days to complete this event. If you are Town Hall 8 or Town Hall 9, I would consider using the GoHo strategy. If you are Town Hall 10 or Town Hall 11, I would just add in 10 hog riders into your normal army composition. These are huge rewards and should be missed out on! A new combination event is here in Clash of Clans, combining valkyries and rage spells for a killer combination. Both the troop and the spell will be at a 90% discount throughout the event but you only need to use valkyries to win the rewards. If you win 10 attacks using 6 valkyries, you will be rewarded with 300 XP and 100 gems! Valkyrie and rage spells actually have pretty good synergy, so you should be able to combine them together quite well. Personally, I would recommend GoWiVa attacks, since that can work well for both farming and pushing! One of the most popular strategies in Clash of Clans gets its own event, the LavaLoonion event! 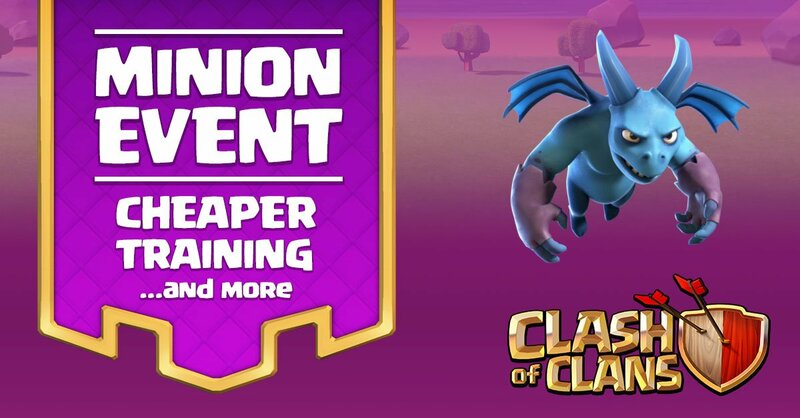 During this Clash of Clans event, you can receive three different rewards, one for using each of the LavaLoonion troops (lava hound, balloon, and minions). If you use 2 lava hounds, 10 balloons, or 24 minions, and win 10 times with each one, you will receive 150 XP and 30 gems! Obviously, the strategy that you should attack with for this event is LavaLoonion. By training up LavaLoonion, you will be able to get all three rewards much faster than if you attacked with each troops individually. We have guides for TH9, TH10, and TH11 LavaLoonion if you aren’t sure how to attack with this strategy. A brand new Clash of Clans event is here, which combines golems and jump spells in a killer combination. This event has been dubbed “Rockslide!”. As usual, you will get a 90% training discount on both golems and jump spells, but you only need to use golems to get the rewards. If you use 2 golems and win 10 battles, you will be rewarded with 300 XP and 100 gems! Golem and jump spell pair together pretty well, so I would suggest using a GoWi attack of some sort. Try to get all your golem down and then jump them right into the core of the base! Good luck getting the rewards! Next Event: Reign from the skies! The newest Clash of Clans event is the dragon+lightning event, otherwise referred to the earn 200 gems event! In this event, you have a great cost discount in both dragons and lightning spells. The rewards for this event are insane, with you receiving 600 XP and 200 gems for winning 15 battles with at least 2 dragons in your army. With rewards this size, you definitely want to try to win with dragons in your arsenal. My recommendation would be putting 2 dragons in whatever army composition you are using, since 40 troop space isn’t that much. Or you could use the lightning discount to rock mass dragons and lightning down air defenses… just depends on how you want to play the event! One of the best combos in Clash of Clans finally got its own event, combining balloons and haste spells in an awesome army composition. For this event, you can train both haste spells and balloons for 90% off, but you only need to use balloons to win the event. If you win 15 battles with 10 balloons, you receive 600 XP and 200 gems! Better try to win this event! So in order to win this, you should definitely be using either LavaLoonion or precision balloons. I would recommend precision balloonion for the one star since that is where the haste spells shine. Good luck with the challenge! There is going to be another clan war XP event, with this event giving double XP for all clan wars, regardless if you win or lose! This is a great opportunity to boost your level, even if you are terrible at clan war. So take advantage of this event by having two wars over the next three days to maximize your XP from the wars! Enjoy the event all of you intense war players! There is a huge new event going on for those who do clan wars often, with the clan reWARds event! In this event, you earn 2x the loot and 2x the XP in clan war, no matter if you win, lose, or draw! This means a good bit of extra resources for every war you participate in. Of course, the way to take advantage of this event is to do as many clan wars as possible, but you can only do 2 in the amount of time that the event last. Try to get two in and pick up an extra million of each resource! The freeze spell event is here in Clash of Clans, right in the wake of the Builder Hall 7 update! Despite competing with an update, the freeze spell event is still great, giving you a 90% discount on freeze spells! So there isn’t a reward for this event, but you can still train up freeze spells to make your army cost A LOT cheaper. Obviously, this only impacts TH9 and up, so TH8 and below shouldn’t be worrying. Try some GoWiPe to bring out the freeze spell against inferno towers! A three way event appears again in Clash of Clans, this time in the “Triple Threat!” event. This event is going to focus on the GoVaHo army composition, revolving around golem, valkyrie, and hog rider. There are rewards for winning with each type of the troop giving 200 XP and 30 gems for winning 10 battles. To get each individual reward you have to use 2 golems or 6 valkyries or 10 hog riders. Now, it is pretty obvious how you are going to get all the rewards in this challenge… by using GoVaHo! Cook up your best GoVaHo army, battle with it 10 times and you will get some insane rewards! 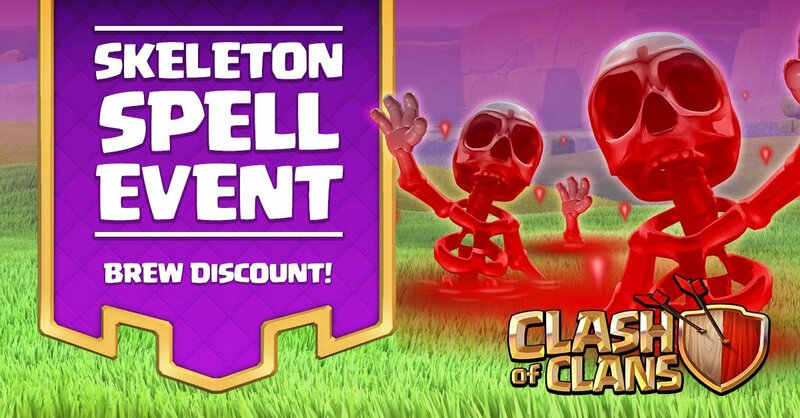 The skeleton spell event is back in Clash of Clans, allowing you to brew skeleton spells at a discounted price. Unfortunately, as with all spell events, there will be no rewards for using the skeleton spell. To be honest, I wouldn’t take advantage of this event because the skeleton spell is SO bad. Better to stick with your normal army composition than try to fit the skeleton spell somewhere into your strategy. The newest Clash of Clans event is the baby dragon event, coming at the same time as the 4x star bonus! Despite also having the 4x star bonus event going on, you can still get mad rewards from the baby dragon event, which gives you 100 XP and 30 gems if you win 3 battles with 5 baby dragons! In order to win those battles, I would just throw in 5 baby dragons with your normal army composition. They are only 25 army space in total and can fit in well because of their rage spells. Remember, this event doesn’t count in Builder Base! Everyone’s favorite event, the 4x star bonus event, is here again in Clash of Clans! The 4x star bonus event gives you 4 times the amount of star bonus you would normal get, usually totaling over 1,000,000 gold and elixir for just 5 stars. In order to get as many stars as possible, you should be using heavy army compositions like LavaLoonion, golem armies, and bowlers. Be focused on getting stars, not loot because stars are worth so much more during this event! For about the 4th time, the poison spell event is back in Clash of Clans! 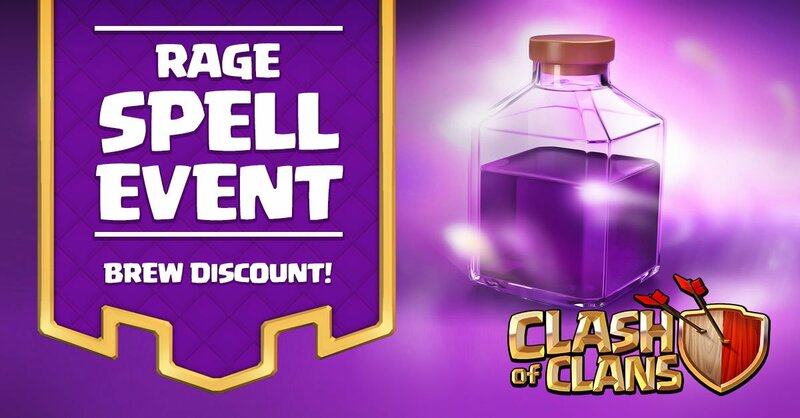 Unfortunately, like all spell events, the poison spell event doesn’t provide a reward, but you do get a 90% cost reduction for all the poison spells that you brew! There isn’t a great army composition specifically for the poison spell, but you can brew more than necessary to ward off any clan castle troops with ease. Having 3-4 poison spells will shut down the defending troops completely. Events are FINALLY back in Clash of Clans after the very long Clashiversary event. The first event on the agenda is the jumpy giant event, where you can combine giants and jump spells for cheap. However, the event only counts giants towards your rewards, giving you 300 XP and 100 gems if you win 10 battles using 10 giants! These double troop/spell events are always fun and you should switch up your usual army composition to incorporate it. I would suggest farming with giants, since the jump spells will allow you to easily get in there and reach the core of the base! The baby dragon event is finally here in Clash of Clans! This challenge will offer rewards for completion, namely 100 XP and 30 gems. You will have to use 5 baby dragons in each attack in order for it to count as a win though. As always, the baby dragons will be 90% discounted for a cheap, cheap price! Some great strategies to use these guys with are LavaLoonion and mass baby dragons. For the LavaLoonion attack, you can pop these in for clean up, while in mass baby dragons you just kind of want to spread them around to pick off all the full collectors! The earthquake spell event is back in Clash of Clans for the third time. Like all spell events, there are no gem and XP rewards for winning this one, only a cost discount. Still this discount is 90% off and should not be wasted. The best attack strategy to use with the earthquake spells is GoWiPe or GoWiWi. This allows for a big section of walls to be opening, giving immediate access to many different compartments within the base. Earthquake spells are the number one way to access the whole of a base! Next Event: Earn more from Clan War! The newest combo event in Clash of Clans is the electric minion event which combines minions and lightning. Both of the minions and lightning spell are discounted, but you only need to use minions in order to win the rewards! If you win 10 multiplayer battles with 24 minions, you will be rewarded with 300 XP and 100 gems. So what army composition should you be using to win this event? Well since lightning spells are discounted, there are two strategies you could go with. The first is BAM, where you use lightning spells to take out the mortars/wizard towers. The second is LavaLoonion, where you use the lightning spells to take out the air defenses. The healing spell event is back in Clash of Clans! Like most spell events, this event won’t be giving off rewards like gold and XP, but you still get a nice cost reduction by 90%! This event is designed for mass hog players. Town Hall 8s and Town Hall 9s, take advantage of this event to bust out some hog rider attacks in war. Also train some heal spells with whatever attack strategy you are using, every strategy can use a heal or two within it! The newest Clash of Clans event is going to be the valkyrie event! Unlike the last event, the valkyrie event will be giving rewards as well as allowing you to train valkyries at a 90% cost reduction. The reward for winning 3 battles with 14 valkyries or more will be the typical 100 XP and 20 gems. If you want to win with valks, you should consider attacking with GoWiVa, which is a really powerful attack strategy from Town Hall 9 and up. Valkyries aren’t the most popular troop, but if used correctly, they can dominate! 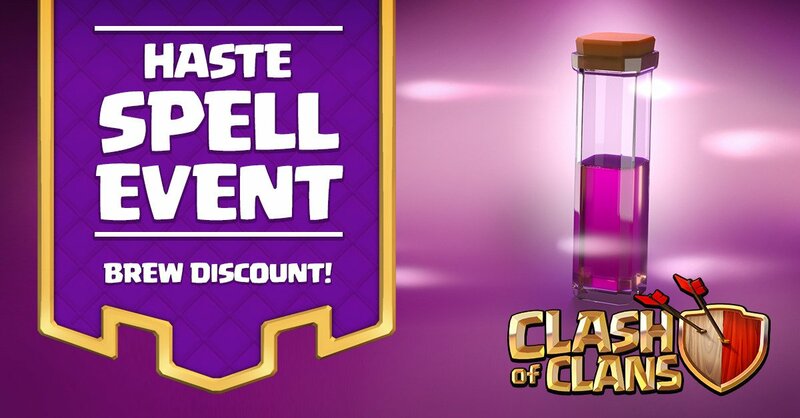 The poison spell event is back in Clash of Clans! Unfortunately, this time around, the poison spell will not be offering rewards, but will only have the cost discount. 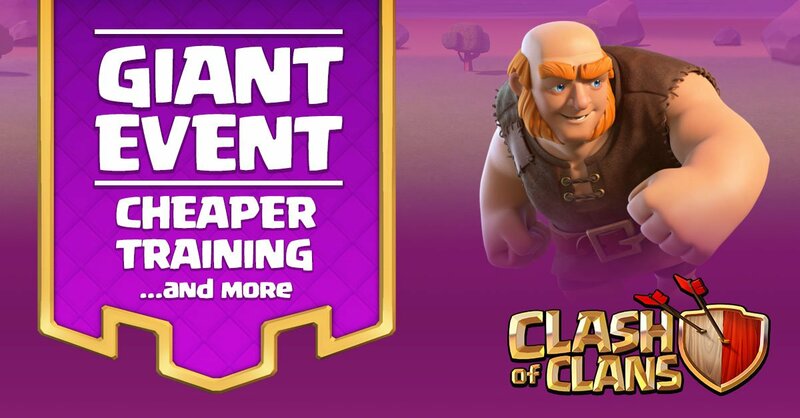 The cost has been reduced 90% as typical with these Clash of Clans events! Now, poison spells can fit in basically any deck, so you don’t need to build a deck based around the poison spell. Bring a couple so that you can kill CC troops easier in your raids for a lot cheaper! Another combo event is here in Clash of Clans! Now, instead of the GoWiWi event, we have the balloon zoom event which combines balloons and haste spells which is a powerful combo. This event is a little bit different, with you needing to win 10 battles instead of 3 to get the rewards. However, the rewards are bigger also, with 100 XP and 100 gems on the line. Of course, you can go with the normal LavaLoonion strategy to win this, just replace your rage spells with haste spells. Or you can work with the precision balloonion strategy, going for the one star. A win is a win, no matter the stars you get! The 4x star bonus is back in Clash of Clans! This is definitely the most valuable event in Clash of Clans, generating 4x your star bonus if you get 5 stars. For example if your normal star bonus is 220k of each and 1100 DE, it will now be 880k and 4400 DE, just for getting 5 stars. Builder’s Base doesn’t count for any stars. So you want to get this 4x star bonus, since it is worth more than any single raid you are likely to find in multiplayer battles. Use heavy armies so that you can get this loot faster! 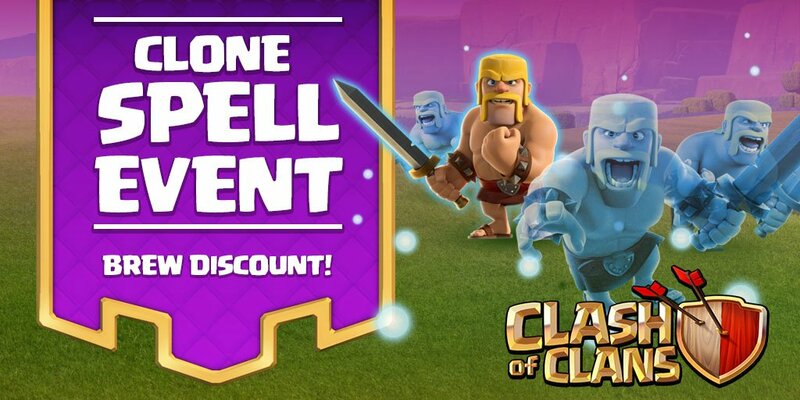 The newest Clash of Clans event is the clone spell event! Despite the clone spell being one of the worst spells in Clash of Clans, there will be no incentive for using the clone spell, except for decreased cost. All clone spells will be 90% off to train during the event! So there aren’t a lot of good army compositions to use with the clone spell, the best being some form of GoWiWi. However, you can create some fun armies with the clone spell, trying out some mass dragons with clone spells or barch with clone spells! Just have fun with clone spells! The healing spell event is here in Clash of Clans! Unfortunately there will be no rewards with this event, but you do get to train heal spells for 90% off. Spells are always the best for the cost reduction! So the number one strategy to use heal spells with is mass hogs. For you Town Hall 8s and Town Hall 9s, make sure to get out there and do some war attacks while you can get heal spells cheap. The newest Clash of Clans event is the jump spell event, not the most exciting of all events. With this event, you get no rewards of gold or elixir, but you do get the standard 90% cost reduction! Now, earthquake spells have become the real meta for the getting through walls, but you can always use a good jump spell for LavaLoonion or hog kill squads. Jump creates a smaller area, but it works perfectly fine especially if you are using classic golem decks! The skeleton spell event in here in Clash of Clans! This isn’t the best spell in the game by far, but you do get to train these skeleton spells for 90% off. However, there are no rewards, so it seems almost pointless to participate in this event. So strategy for the skeleton spell is really limited, but if you want to throw one in for kicks, you can do it with basically any composition. Just play it and add a skeleton army to your attacking force! Next event will be much better guys! 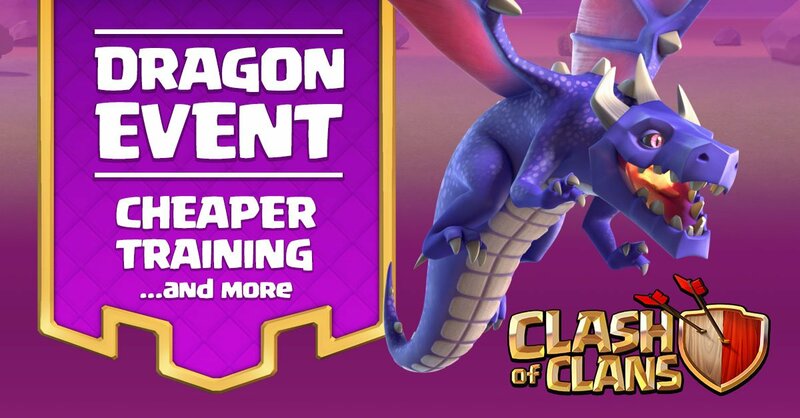 The newest Clash of Clans event is the dragon event! Dragons are super strong at both Town Hall 7 and 8, so you guys should be taking advantage of this one. Not only do you get a cheap training cost, but you also get the standard reward (30 gems, 300 XP) for winning 3 battles. You only need to use 2 dragons to seal an attack that counts. Like I said, TH7 and TH8 will be killing it this event. Bring out the mass dragons to dominate! As for you higher Town Hall levels, use the OP LavaLoonion strategy, but bring 2 dragons along for the ride so that you can grab the reward with the win. The 2x star bonus event is back for the third time in Clash of Clans! This event doesn’t give you 2x as many stars, but instead gives you 2x as much loot when you complete your 5 star bonus. This is one of my favorite events as it makes farming easier, even if it doesn’t discount any troops. So you are going to want to get as many stars as possible during this event. Therefore, I’d recommend using three star armies! This means mass drags at TH7, hogs at TH8, and LavaLoonion from TH9+. The giant event is here in Clash of Clans! This event will offer both a troop discount and a reward for winning 3 battles with giants. You have to use 9 giants, but in return you earn 300 XP and 30 gems for your efforts! Plus, with a 90% cost discount you should be training these guys up anyways. Giants are a very versatile troop, so you should be able to easily use them to succeed. The best use for them is farming, where you want to penetrate deep into the base to get some storages! Goblin knife will work super well with this event. 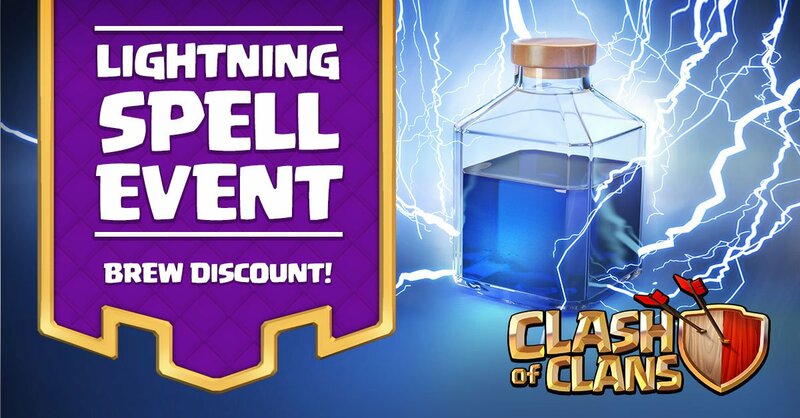 The newest Clash of Clans event is the lightning spell event! This event doesn’t offer any rewards, like XP or gems, but it does take off 90% of the cost when brewing them. Lightning spells have fallen out of the meta a lot since the introduction of poison spells but at Town Hall 7 and Town Hall 8 they are still very viable. Use lightning spells to take out an air defense so that you can win your mass dragon attack easier! The cost will save you about 60k elixir per raid. The minion event is here in Clash of Clans! Minions are one of the best support units in Clash of Clans, so you should take advantage of this event. Luckily, this event offers rewards, with 300 XP and 30 gems as a reward for winning 3 battles with at least 22 minions in your deck. Some great strategies to use with minions are BAM, along with LavaLoonion. Use B(arbarians)A(rchers)M(inions) for farming and take as many minions as you want! For LavaLoonion, you want to bring a good amount of clean up minions! 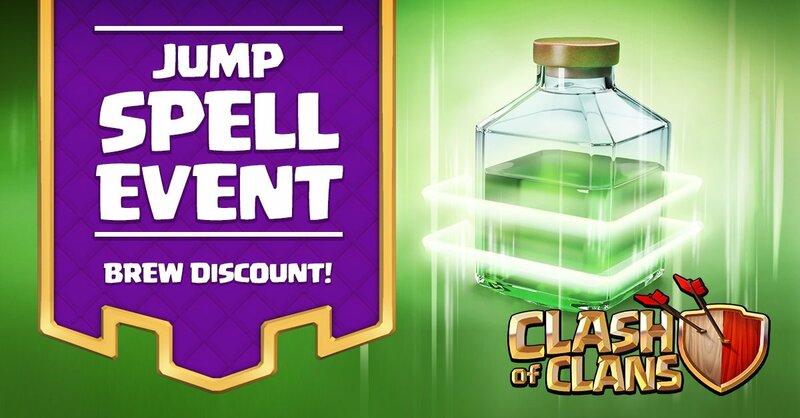 For this Clash of Clans event, we have one of the worst spells in the game, the clone spell! With this event, we don’t even get the reward of XP and gems, only a cost reductions. Clone spells will be 90% cheaper to train. Now its really hard to use the clone spell in an army, but if you have to the clone spell has pretty good synergy with golems. Maybe try out some old-fashioned GoWiPe or GoWiWi? Anyways enjoy the cheap cost! 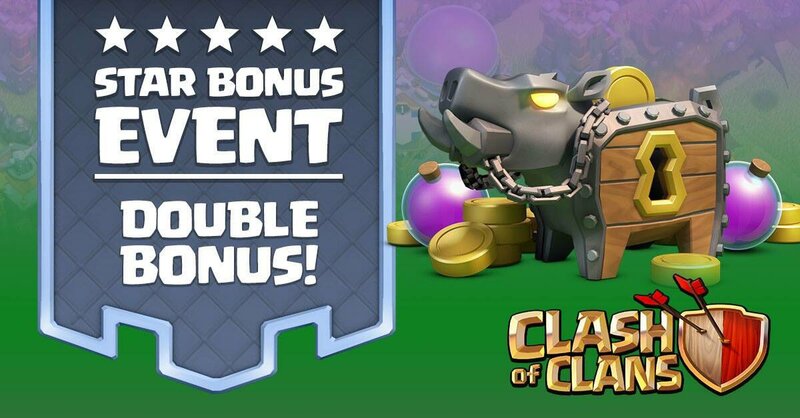 The 2x Star Bonus event is back in Clash of Clans! This one is awesome with your star bonus being doubled once you hit 5 stars. Unfortunately, the star bonus isn’t inifinite; you get it reset every day. So to get the most amount of stars you want to use high strength armies. For Town Halls 6-7, giant healer should work fine for you. For Town Halls 8-9, hogs are great for three starring. Lastly, when you are Town Hall 10-11, you should use LavaLoonion for an easier three star before it gets nerfed. Clash of Clans is finally mixing it up a bit with the GoWiWi event! 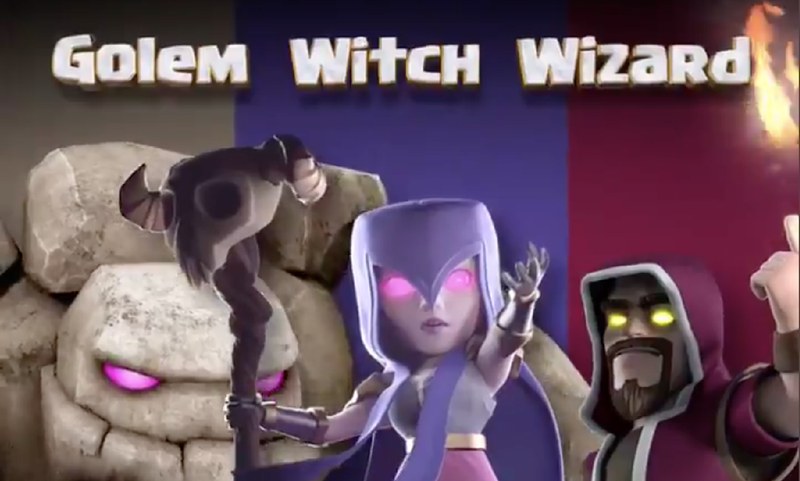 No longer are we going to have single unit events, but now it is 3 different units, the golem, witch, and wizard, that make up the GoWiWi strategy. Since it isn’t a single troop, rewards are weird. You don’t get a reward for using golems, but you do get rewards for using 11 wizards and 4 witches. You’ll have to win the standard 3 battles to gain 300 XP and 20 gems. Also, all these troops are 50% off training price, not 90%. So obviously, the best way to get the rewards is to use the GoWiWi strategy. 3 of these raids should easily get you the win. However, there is nothing that says you have to use the troops together to get the reward. Just throw in some wizards and witches into your normal strategy and you’ll be good to go! 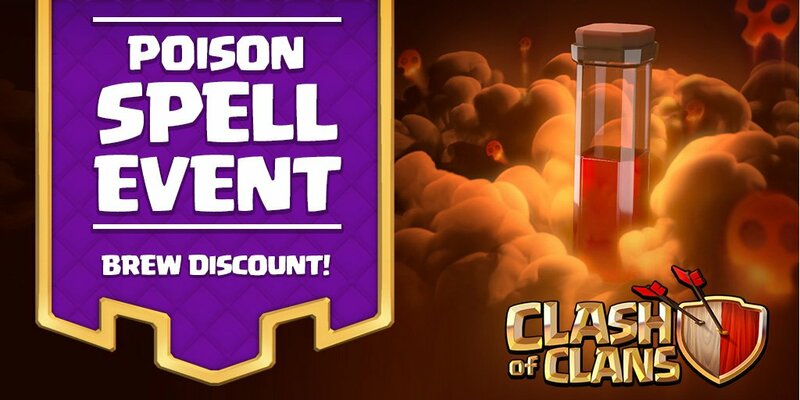 We have come to one of the last spell events within Clash of Clans, the poison spell event! There will be no XP and gem bonus for this event, but as always, we will be getting the 90% off cost. Be sure to take advantage of the cheap cost in your CC kills! So there isn’t really any strategies based around the poison spell that you could utilize, but you can use it to make cheaper CC kills while pushing or in war! Train up 2-3 of these to really do damage quickly to the defending troops. 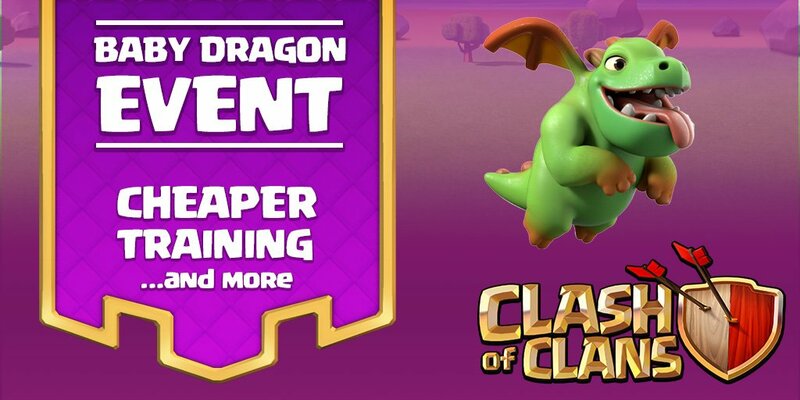 Baby dragons are finally getting their own event in Clash of Clans with the baby dragon event! With the baby dragon event, rewards will be available but it isn’t the the typical 300 XP-30 gems. For this event, you get 100 XP and 30 gems if you win 3 battles using at least 4 baby dragons. Along with the rewards, baby dragons are 90% off! Mass baby dragons is a somewhat good strategy to use for this event, but an even better one would be LavaLoonion with baby dragons as support units! They are really quite good at cleaning us since they have a rage when they are alone. Use the 90% cost reduction to your advantage! The rage spell event is here in Clash of Clans! For this event, you will be able to train rage spells for a discounted 90%. Unfortunately, there will be no rewards for this event, just the cost discount. Since rage spells are so cheap though, you guys should get out there with raged armies! LavaLoonion is one of the greatest strategies that uses rage spells. For farming though, a giant goblin composition would love some cheap rage spells to help them get all of the loot. 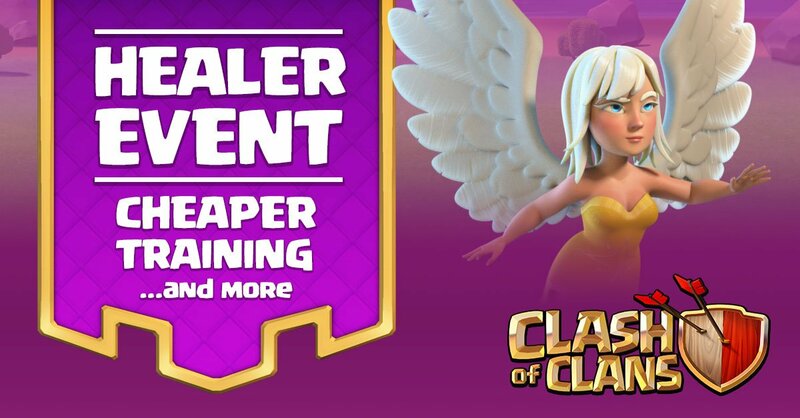 Following up the haste spell event will be the healer event for Clash of Clans! This healer event comes with rewards, meaning 300 XP and 30 gems for completion. You can receive the XP and gems by winning 3 battles with at least 3 healers. Along with that reward, all healers are discounted 90%, making a level 4 healer cost only 1000 elixir. Since healers are so discounted, you are going to want to train them up to take advantage of their low elixir cost. I would recommend giant-healer for you lower TH farmers out there, while having a queen walk for TH9+ has just gotten a lot easier! Make sure to enjoy the healer event! The latest Clash of Clans event is the haste spell event! The haste spell is a dark elixir spell that increased troop movement speed, a bit like a weaker rage spell. Unfortunately, for this event there is no reward, only a decreased cost. Like always, the cost has been reduced by 90%, making haste spells cost about as much as a minion. Since the haste spell is so cheap, you should take advantage of its cost by using armies that cater to the haste spell. Precision balloonion is a great one for this, along with a lot of farming raids like giant-goblin. Good luck during this event! 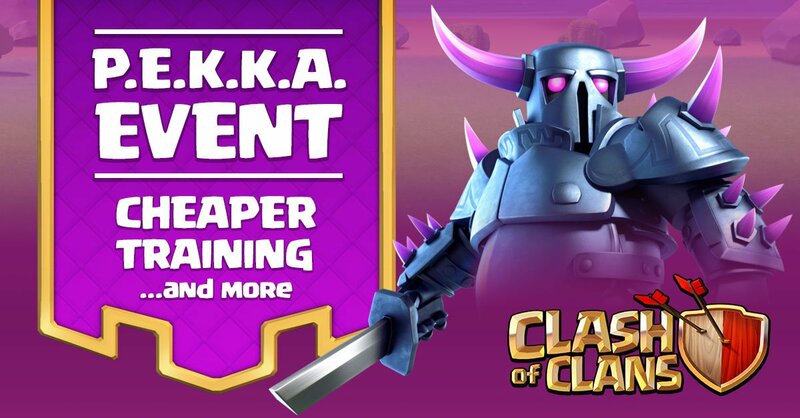 The PEKKA event in here as the latest Clash of Clans event! Along with using one of the staples of Clash of Clans, you get 300 XP and 30 gems for winning just 3 battles using only 2 PEKKAs. As with all Clash of Clans events, the cost has been decreased by 90%, making PEKKAs, as cheap as giants to train. So if you want to succeed in this event, I would suggest not using a full on PEKKA army. Instead, a regular barch with PEKKAs to tank or a giant-goblin deck with PEKKAs mixed in. Good luck getting those gems! The star bonus event is back for Clash of Clans, but this time your loot is times 4! Clearly there is no added gems and XP for this event, but having 4x the loot from getting stars can get you so many resources it is crazy! Personally, my star bonus is now up to 700k and 3k for getting only 5 stars! With stars being so key to this event, you should definitely be using 2 and 3 star armies to get the bonus as fast as possible. I’d recommend LavaLoonion or giants in order to get those stars! Good luck and try to get as much loot as possible! 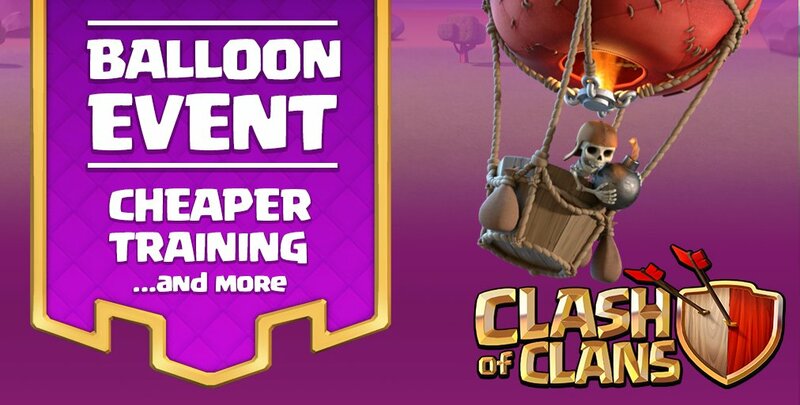 The newest Clash of Clans event is the balloon event! With the rise of LavaLoonion since the latest balance change, balloons are some of the best units in the game. Luckily, this event features XP and gems for completing the event. In order to get these rewards, you need to win 3 battles with 9 balloons each. Cost is also decreased by 90%. So as I mentioned above, with this event, you should definitely be using LavaLoonion if you are TH9 and up. With the decrease of balloon cost, you can train the expensive LavaLoonion composition at much cheaper. Try to push some trophies during this event! 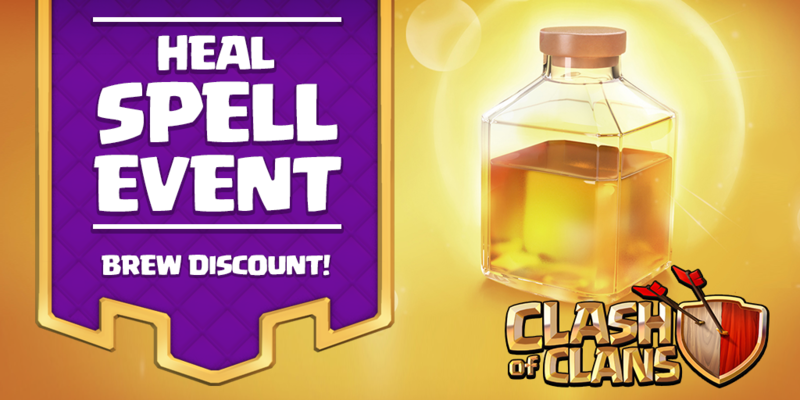 The healing spell event is here for Clash of Clans! Unfortunately, this event doesn’t offer free gems and XP if you are able to complete it, but you can still train heal spells at an absurd discounted price. It will be the standard 90% off for all events. With heal spells being so cheap, you should definitely use an army with them to cut down elixir costs. My recommendations? Go with hog-heal if you are TH8 or TH9. Also barch with some heal spells is a great farming technique to pick up a bunch of loot. Kind of disappointed there is no reward but, hey, you get what you get! 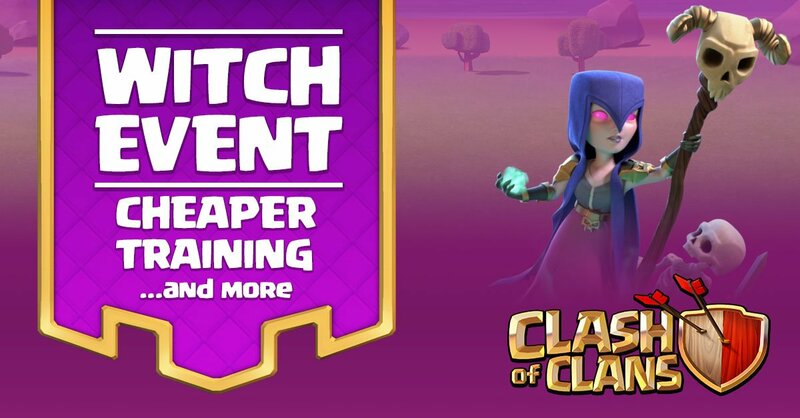 The next Clash of Clans event is here and it is the witch event! The witch event only lasts 2 days, ending on January 29th. However, the witch event will offer XP and gems for completing it, giving you 300 XP along with 30 gems for winning 3 matches. You must use 4 witches in your army to take home the prize! Witches are discounted 90% making a level 2 witch cost 35 elixir instead of 350 elixir. With a decreased price, you should definitely be trying them out, for fun, if for anything! Mass witches is still somewhat strong and you can bring back a classic strategy with GoWiWi if you want to go old school Clash of Clans. 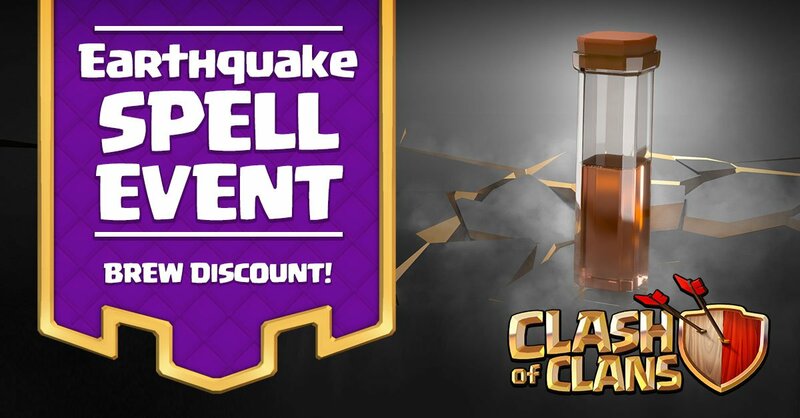 The newest Clash of Clans event is the earthquake spell event which will take place from January 24th to 26th. Unfortunately, there won’t be any gems or XP offered with this, but you will get a 90% discount on all earthquake spells. The earthquake spell is a really good spell for big ground pushes like GoWiPe and mass witches. Not really great for farming, but if you are pushing hard for trophies, then make sure to train up 8 earthquake spells for a pretty cheap cost! My bad, just a typo… all fixed! What was the point of this article? Pingback: Clash of Clans Events- The Art of War Event | Clash of Clans Guide, Strategies, Tricks and More! Pingback: Clash of Clans Events- Schoolhouse Rock Event | Clash of Clans Guide, Strategies, Tricks and More! Pingback: Clash of Clans Events- Hateable Inflatable Event | Clash of Clans Guide, Strategies, Tricks and More! Pingback: Clash of Clans Events-Sparks Will Fly Event | Clash of Clans Guide, Strategies, Tricks and More! Pingback: Clash of Clans Events-Angry Angels Event | Clash of Clans Guide, Strategies, Tricks and More! Pingback: Clash of Clans Events- Valkyrie + Rage Spell Event | Clash of Clans Guide, Strategies, Tricks and More! Pingback: Clash of Clans Events- LavaLoonion Event | Clash of Clans Guide, Strategies, Tricks and More! Pingback: Clash of Clans Events- Golem+Jump Spell Event | Clash of Clans Guide, Strategies, Tricks and More! Pingback: Clash of Clans Events- Dragon+Lightning Event | Clash of Clans Guide, Strategies, Tricks and More! Pingback: Clash of Clans Events- Hasty Balloons Event | Clash of Clans Guide, Strategies, Tricks and More! Pingback: Clash of Clans Events- Clan War XP Event | Clash of Clans Guide, Strategies, Tricks and More! Pingback: Clash of Clans Events- Clan ReWARds Event | Clash of Clans Guide, Strategies, Tricks and More! Pingback: Clash of Clans Events- Freeze Spell Event | Clash of Clans Guide, Strategies, Tricks and More! Pingback: Clash of Clans Events- Triple Threat! Event | Clash of Clans Guide, Strategies, Tricks and More! Pingback: Clash of Clans Events- Jumpy Giant Event | Clash of Clans Guide, Strategies, Tricks and More! Pingback: Clash of Clans Events- Baby Dragon Event | Clash of Clans Guide, Strategies, Tricks and More! Pingback: Clash of Clans Events- Earthquake Spell Event | Clash of Clans Guide, Strategies, Tricks and More! Pingback: Clash of Clans Events- Electric Minion Event | Clash of Clans Guide, Strategies, Tricks and More! Pingback: Clash of Clans Events- Poison Spell Event | Clash of Clans Guide, Strategies, Tricks and More! Pingback: Clash of Clans Events- Balloon Zoom Event | Clash of Clans Guide, Strategies, Tricks and More! Pingback: Clash of Clans Events- 4x Star Bonus Event | Clash of Clans Guide, Strategies, Tricks and More! Pingback: Clash of Clans Events- Healing Spell Event | Clash of Clans Guide, Strategies, Tricks and More! Pingback: Clash of Clans Events- Jump Spell Event | Clash of Clans Guide, Strategies, Tricks and More! Pingback: Clash of Clans Events- Skeleton Spell Event | Clash of Clans Guide, Strategies, Tricks and More! Pingback: Clash of Clans Events- Lightning Spell Event | Clash of Clans Guide, Strategies, Tricks and More! Pingback: Clash of Clans Events- Minion Event | Clash of Clans Guide, Strategies, Tricks and More! Pingback: Clash of Clans Events- Clone Spell Event | Clash of Clans Guide, Strategies, Tricks and More! Pingback: Clash of Clans Events- 2x Star Bonus Event | Clash of Clans Guide, Strategies, Tricks and More! Pingback: Clash of Clans Events- GoWiWi Event | Clash of Clans Guide, Strategies, Tricks and More! I think I might return to clash of clans. You definitely should! I took a 6 month break during the opening days of CR, but I’ve been playing again for a while now and it is awesome! doesn’t your account get deleted after not being on for 180 days? I still don’t think so, I’m not sure exactly what it takes.